The Acacia, commonly referred to as wattle is a genus of shrubs and trees belonging to the subfamily Mimosoideae of the family Fabaceae. There are approximately 1,350 species of wattle, of which close to 1,000 are native to Australia. The plant is valued by Koori people as a source of food, medicine and for the quality of its timber, used in the production of a range of tools and weapons. The gum of a number of wattle varieties is edible, with the flavour akin to that of a mild sugary sweetness, which can become unpalatable when offset by high amounts of the plant’s tannin. The gum in some cases was utilised in the production of a drink, which served as remedy to coughs, colds and chest infections. Gum could also be applied directly to cuts and abrasions as an antiseptic preparation, either in a solid or powdered form. The seeds of a large number of wattle species are edible and may be harvested for grinding into a flour, for the production of bread, or an edible paste. Very little work has been done to determine the number of species with edible seeds, or gums, with commercial harvests drawing from only a few specific species known to have been harvested by Koori people over many thousands of years. Recent commercial usage has seen the seeds roasted to produce a coffee substitute and powdered seeds used as a spice, which have also been incorporated into the production of ice cream and biscuits. In the lower half of New South Wales and throughout Victoria, Blackwood (Acacia melanoxylon) was the most widely utilised wattle species. It is prized for the commercial quality of timber it produces, which is useful in making a range of traditional weapons, inclusive of boomerangs, spear throwers, spears, digging sticks, parrying shields and clubs. In semi-arid regions the Mulga (Acacia aneura) and Gidgee (Acacia cambagei) variants of wattle are prized for their beautiful timbers, which grow more slowly and offer a harder timber than coastal varieties. Gidgee is also valued for the occasional ringed variety, where malformations in a tree’s growth occasionally result in wavy fiddle back pattern through the grain of the timber. Wattle bark has been used by Koori people as a traditional fish poison and pain killer. Whilst the smoke from the plant has been used in the treatment of diarrhoea. 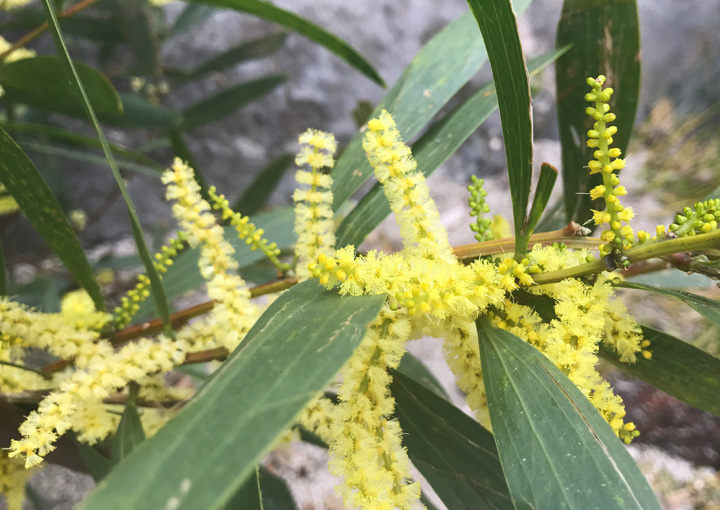 Non-Indigenous usages of wattle plants have included various species being harvested for their timber, for use in the production of musical instruments, including guitars and ukuleles. Certain species of wattle produce a psychoactive alkaloid called DMT, whilst a number of species also have value for the high amount of tannin to be found in their bark, having been utilised by a limited segment of the tannery industry, for over 200 years. Wattle plants also serve as seasonal indicators. In Bundjalung Country, the falling of wattle blossoms into the water is a signal that it is time to no longer hunt the Eastern Long Necked Turtle, which will be entering its breeding season. Whilst the Wurundjeri people of the Greater Melbourne area of Victoria would similarly see the falling of the Silver Wattle (Acacia dealbata) as a signal that it was the time of year to begin the harvesting of eels.